Fig. 1. Exchange of nucleotides from the Ga subunit. Upon receptor activation, the Ga subunit goes from the GDP-bound form to the GTP-bound form. 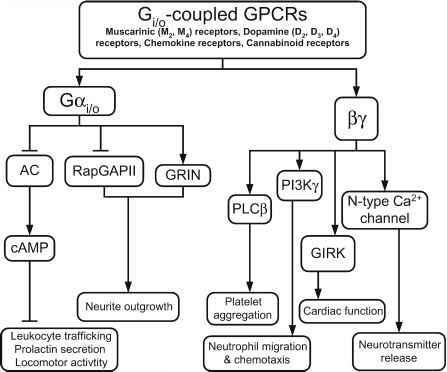 Ga-GTP has lower affinity towards GPy subunits, causing dissociation of the complex. Termination of the response takes place when the G protein returns to the basal state as a consequence of GTP hydrolysis. RGS proteins accelerate the rate of hydrolysis. The initial observations that suggested that RGS proteins have a role in signal termination were performed in yeast (5) and nematode worms (6). The sst2 gene was discovered in a genetic screen of mutants showing an arrest in the G1 to S-phase transition cycle—an indication of a termination failure of the mating pheromone response (7). Loss of the Caenorhabditis elegans egl-10 gene by mutation resulted in a decrease in egg-laying, which is a behavior inhibited by serotonin (6). These genes from yeast and nematodes shared a 120-amino acid region also found in GOS8 (an immediate early gene in T-cell activation) (8). Subsequent studies by Kehrl and colleagues (9) and the laboratories of Peralta and Casey showed that mammalian members of the RGS protein family impaired mitogen-activated protein kinase (MAPK) activity and could bind to the a-subunit of the G protein (10). A yeast two-hybrid screen for proteins that interact with Gai3 resulted in the characterization of another RGS protein, GAIP (Ga-inter-acting protein) (11). 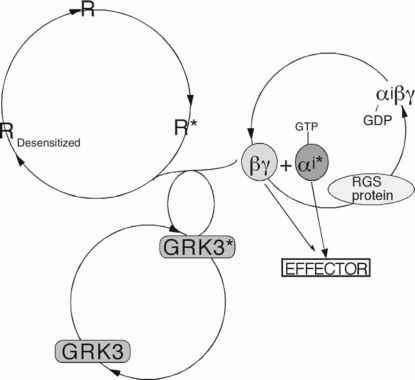 The mechanism of action of RGS proteins became better understood when it was reported that GAIP and RGS4, two members of the RGS family, stabilize the GTP-to-GDP transition state of the G protein a-subunit (12). RGS proteins bind to the switch regions of Ga-subunits (13). To date, more than 30 members of the RGS protein family have been characterized. Based on structural similarities in their RGS box, the RGS proteins have been divided into subfamilies (14,15) (Fig. 3). For example, RGS4 has an Asn residue in position 128, which is conserved in subfamilies B, C, and D. This residue is believed to be involved in the stabilization of the transition state of Ga-subunits (13). Other subfamilies have a Glu (subfamily F), Gln (subfamily E), or Ser (subfamily A) residues in the equivalent position. Fig. 2. Cycle of onset and termination of the G protein-mediated response. Ga-GTP and GPy subunits dissociate as a consequence of receptor activation and interact with a wide range of effectors. GPy subunits can bind to GRK3, a G protein-coupled receptor kinase, and phosphorylate the receptor, turning it into a desensitized state. RGS proteins can bind to the G a subunit and accelerate the rate of GTP hydrolysis.